The Media Department at Birzeit University held its first Media Students Conference, on Saturday, June 30, 2018. 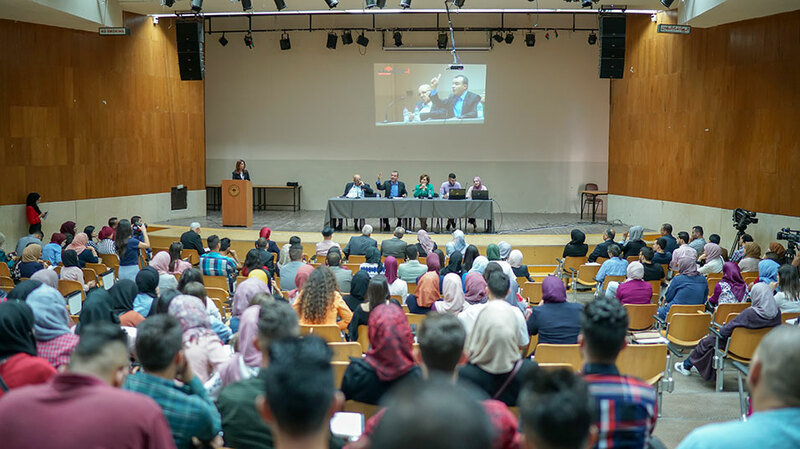 Professors, experts, and around 400 media students gathered in a discussion that highlighted the main issues faced by those who work in the field of media in Palestine. The conference featured papers by Palestinian media students detailing the challenges they faced in their studies and internships. The presenters came from universities across Palestine, including Birzeit University; Hebron University; the Palestine Technical University – Kadoori, Al Arroub Branch; Bethlehem University; Al-Quds University; An-Najah National University; the Arab American University; and the Modern University College, with efforts made to include students from Gazan universities in future conferences. 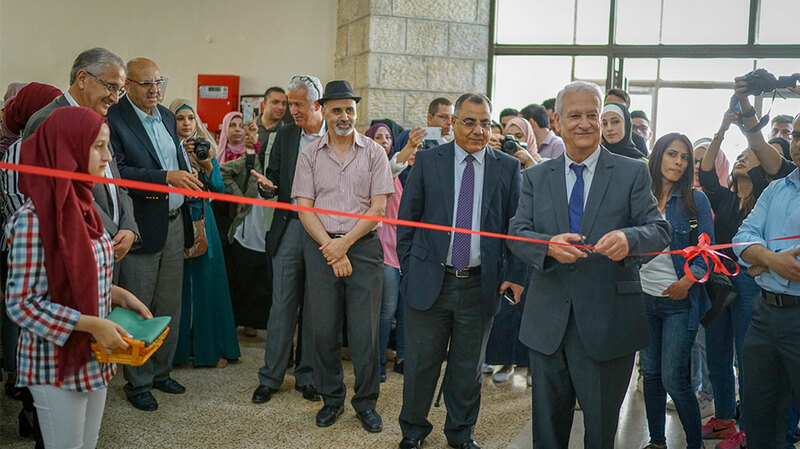 Birzeit University President Abdullatif Abuhijleh noted that the conference can be a stepping-stone to an annual convention that guides decision-makers, media department chairs, and media students in their efforts to improve media education and media field work. 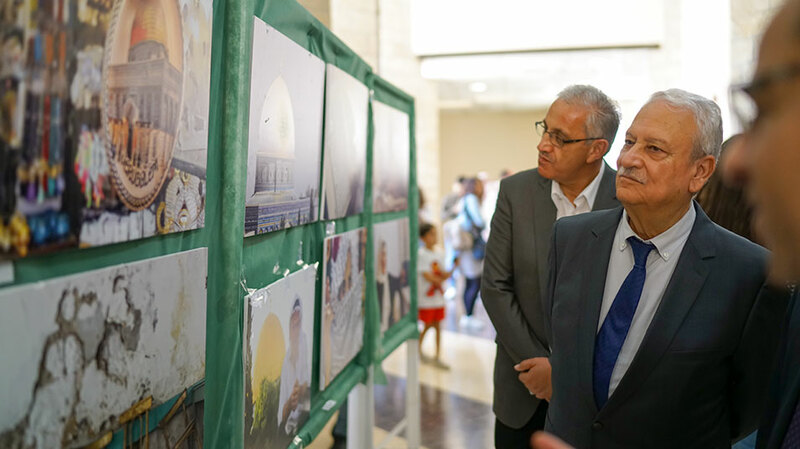 Abuhijleh also inaugurated the “2018 Photo Gallery,” an exhibition of the most compelling photographs taken by media students at Birzeit University. Birzeit University Chair of the Department of Media Jumane Qunnaisse noted in her address that the conference provided Palestinian media-makers a platform to contribute to the improvement of the media sector in the country. “It is imperative that we discuss ways to lower unemployment among media graduates and build their capacities such that they are able to keep abreast of the accelerating progress in the multitude of media fields,” remarked Qunnaisse. Rowand Helles and Tayma Washaha, two students from Birzeit University, presented the first paper, entitled “A Stereotypical Image of the Media Discipline That Distorts the Field,” which was discussed by Walid Omary, chief of Al Jazeera’s Palestine bureau. 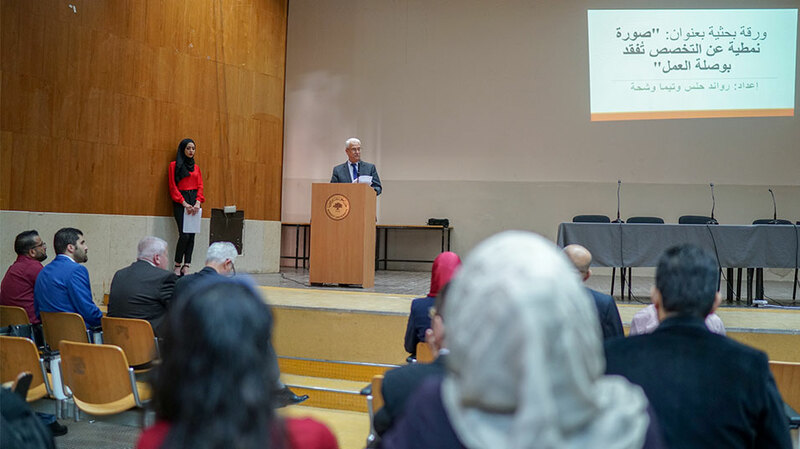 The second paper of the conference, presented by Ayed Halaika, Israa Tawayha, and Fida’ Iskafi, media students from Hebron University, was entitled “A High Number of Graduates and High Unemployment.” The paper’s findings were discussed by Walid Nassar, the CEO of Ajyal Radio Network. The third paper, presented by Ahmad Al Gharooz, Qutayba Qasem, and Haya Hawamdeh, from the Palestine Technical University – Kadoori, was entitled “Academic Programs That Don’t Match the Accelerating Pace of Progress.” Kholoud Assaf, editor in chief of the Palestinian News & Info Agency (Wafa), examined the findings of the paper with the presenters and the audience members. Aseel Dari, a student from Al-Quds University presented the fourth paper, entitled “Late Entry Into the Job Market.” The Paper was discussed by Bassam Walweel, editor in chief of Raya FM, while the fifth paper, “Low Financial Resources,” by Dua’ Malak and Bissan Kharouf, two media students from An-Najah National University, was evaluated by Ibrahim Melhem, editor in chief of Al-Quds website. The sixth paper, “A Shortage of Media Research,” was presented by Mariam Abu Hantash and Marian D’iabes, from the Arab American University. Saleh Masharqeh, the Research and Studies Unit coordinator at the Media Development Center at Birzeit University, reviewed the findings of the paper. The seventh paper of the conference, “The Successful Journalist from the Perspective of Bethlehem University Students,” was evaluated by Hadeel Wahdan, a freelance journalist who previously worked with Al Arabiya and the BBC as a news correspondent.